Visitors wander around the grounds of the King's Bastion at the Fortress of Louisbourg in Cape Breton, Nova Scotia as costumed interpreters mingle amongst them. The long stone building with its many windows, all look out onto the lush green grass and the events that take place outside. Grounds of the King's Bastion at the Fortress of Louisbourg, Louisbourg National Historic Site, Highway 22, Fleur de lis Trail, Marconi Trail, Cape Breton, Nova Scotia, Canada. 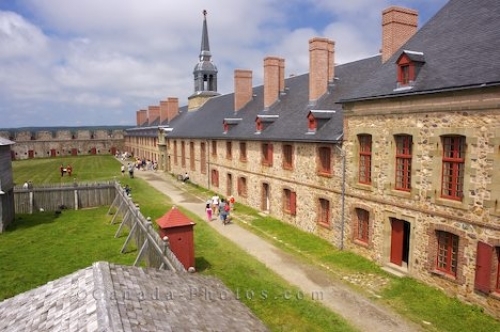 Picture of the grounds that surround the King's Bastion at the Fortress of Louisbourg in Cape Breton, Nova Scotia.